Composition :Each Capsule Contains Hydroxyurea USP 500mg. Indications :Significant tumour response to Hydroxyurea has been demonstrated in melanoma, resistant chronic myeloid leukaemia and recurrent metastatic or inoperable carcinoma of the ovary. Hydroxyurea used concomitantly with irradiation therapy is intended for use in the local control of primary squamous cell (epidermoid) carcinomas of the head and neck, excluding the lip and carcinoma of the cervix. Hydroxyurea used in the management of β thalassemia, essential thrombocythemia and polycythemia vera. Hydroxyurea is indicated to reduce the frequency of painful crises and to reduce the need for blood transfusions in adult patients with sickle cell anemia with recurrent moderate to severe painful crises. Dosage and administration :To minimize the risk of dermal exposure, always wear impervious gloves when handling Hydroxyurea capsules. Hydroxyurea capsules should not be opened. Personnel should avoid exposure to crushed or opened capsules. If contact with crushed or opened capsules occurs, wash immediately and thoroughly. More information is available in the references listed below. Because of the rarity of melanoma,resistant chronic myelocytic leukemia, carcinoma of the ovary and carcinomas of the head and neck in pediatric patients, dosage regimens have not been established. 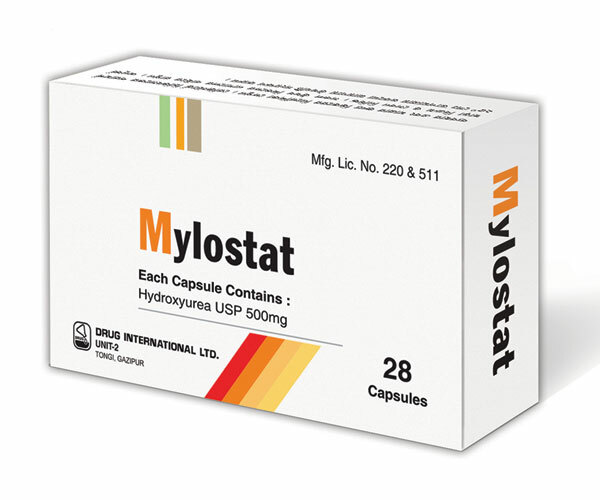 All dosage should be based on the patient's actual or ideal weight, whichever is less.Concurrent use of Hydroxyurea with other myelosuppressive agents may require adjustment of dosages. Since Hydroxyurea may raise the serum uric acid level, dosage adjustment of uricosuric medication may be necessary. Please see prescribing description for more information. Use in pregnancy and lactation : Pregnancy category D. There are no adequate and wellcontrolled studies in pregnant women. There are potential risk to fetus and women should avoid becoming pregnant while being treated with hydroxyurea. It is excreted in human milk. Because of the potential for serious adverse reactions in a breastfed infant from hydroxyurea, including carcinogenicity, patients should be discontinue breastfeeding during treatment with hydroxyurea. Packing :Each box contains 4x7's capsules in blister pack.